As soon as I saw these suggested uses for a box on social media, the ol' light bulb blinked on! I remembered the joy my older grand girls had years ago and decided I'd do the same for the younger ones. Can't believe I painted this one; attached a laminated top for spills and lined the openings with fabric! I found good sizes and shapes from my neighborhood Target, Staples and Kohl's. They were folded but not yet trashed. I chatted with the customer service folks in each store and asked if there was a best day to inquire. I was feeling pretty lucky by the third stop! Shipments arrive daily; after unpacking, boxes are folded and stored until shredded and/or compacted. Most days there'll be some for the asking! Three kids over four days and look at the awesome fun we had! Lane chose the largest of two luggage-containing boxes to be his fort. He suggested a box cutter from the garage..."like Daddy uses"...but none could be found so we settled for sharp scissors. He penciled in lines to follow and I cut an opening for the door. He measured each side and sketched in lines so both windows would be even. He was eager to play in it; so I left him alone. He spent hours playing with Beyblades and munching on snacks and sandwiches. Even better in his eyes was when I crawled in to eat lunch with him! 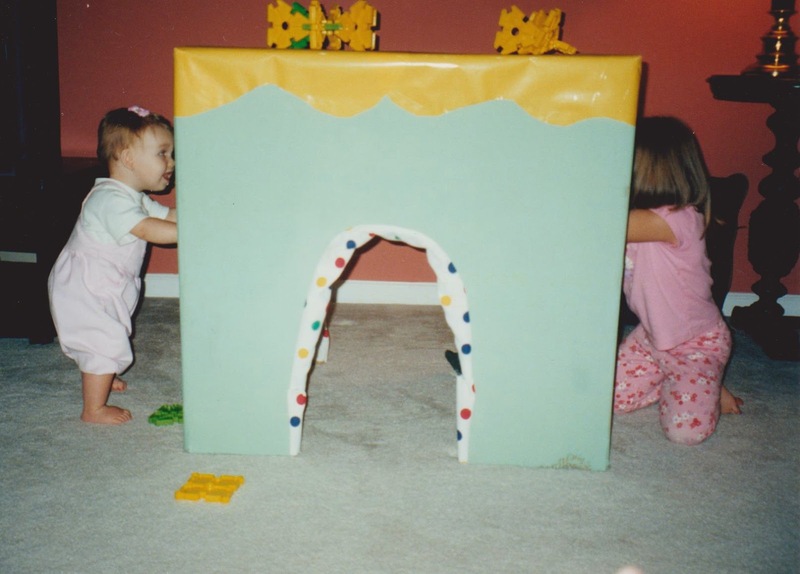 The next day, Paige's idea was to fancy it up with curtains for a house or staging puppet shows. I finally found a use for my Mom's old lace runners! Paige used a glue stick while I held the flashlight and helped keep it even. She lured Burney in and barricaded the windows and door....but he shot out of there with a squeally meow that sounded like "no way!" The following weekend the twins both stayed over and were eager to play with the box; what a perfect way to capture their time and imagination instead of negotiating TV, Kindle and/or computer time limits! Their store was selling pillows, books and dollhouse furniture for "real money!" They emptied their piggy banks and played for hours. If only I'd video taped it and captured their adorable conversation and comments! 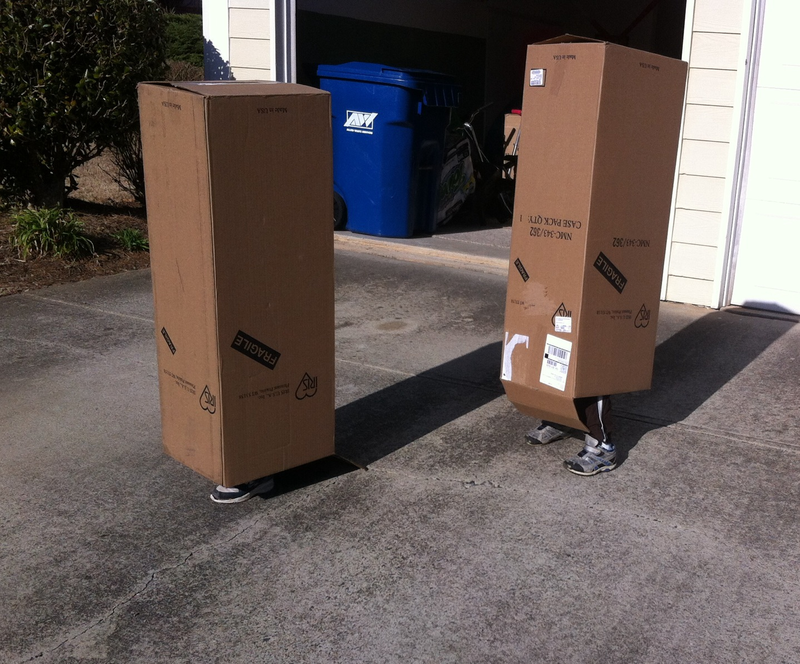 Afternoon temps in the 70's took us outside; but instead of scooters or bikes....they went for the other boxes in the garage and became instant robots! On Sunday, big brother Drew came home from church with me to see "the awesome box" at Grandma's house. He spied the rest of the boxes in the garage and pulled them into the living room where we moved furniture for his creation to fit! He didn't need any help.....just stacked them up, grabbed towels, blankets and pillows and became King of the Castle. He nestled in and eventually asked for his phone (equipped for games only) and I reluctantly set the timer. Giving me an hour of imaginative ideas and creative smiles was worth giving in...that's what Grandmas' do! This is so great to see! All the creativity and play time. 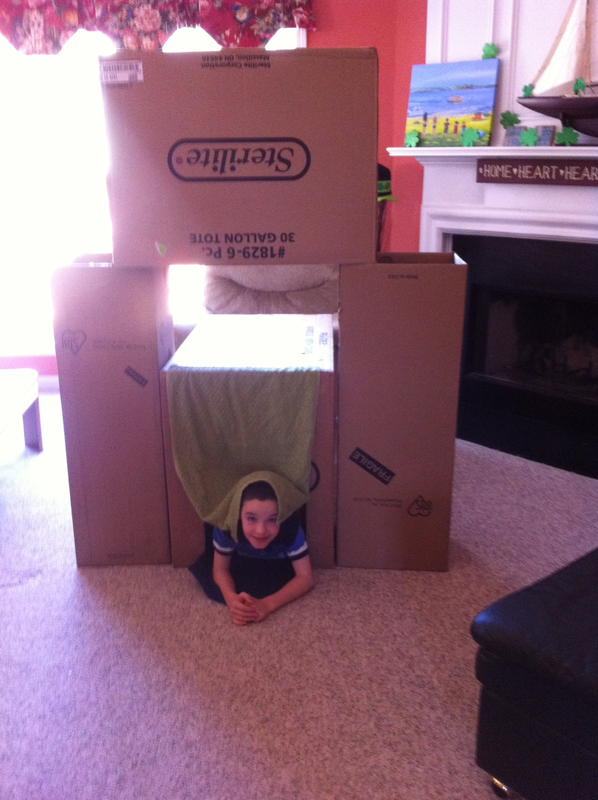 When my son was little he would open a present and then spend hours playing with the box. I love things like this and have had excellent results with the same idea! Imaginations really come to life with boxes to make anything your little heart desires. Your grandchildren are adorable! I wonder if the kitty returned later and nestled in after the kids went home. My cats cannot resist a cardboard box of any size or shape! The imagination is such a wonderful thing! Great photos! Amara used to just love to make trains out of boxes and be pulled around the house. But then she had an indoor ladybug tent so never thought to make a structure from the boxes.. She did decorate her trains! We are so lucky. Boxes are the best! I worked part time at an appliance store when my kids were small and sometimes brought home refrigerator and stove cartons. Thanks for jogging a memory. If you are using Blogger, on the layout page there is a box labeled "my blog list." Click "edit" and follow the prompts. Copy and paste the link; it makes it a lot easier to get it right. Oh, boxes are the very BEST entertainment. Last time I visited my grandsons, I noticed their dad had put a big ol' box from a recliner purchase in the recycle pile. No, no, no, I thought. I pulled it out and it became a beloved fort in no time. Great post, Joan! Thank you for sharing it! Love that grandmas have that vision/creativity and you rescued the big box! They're stacked in my garage when kids are not here.....starting to get crunched and bent and messy looking. Hoping the novelty will wear out by spring cleaning! 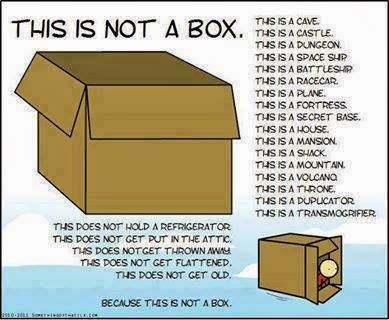 Boxes are definitely the best! Looks like you have some budding architects in your midst! You're a wise grandma to give them a start and let them call the rest of the shots. Thank you sweet Kaye! These are starting to lose their appeal with warmer/outside weather finally here! Awesome robots! In our house it was forts. Lots of blankets, pinned up throughout my daughters room and in our family room. Hours of creative fun and fabulous memories. Today, it's iPhones for 4 year olds. Ugh. 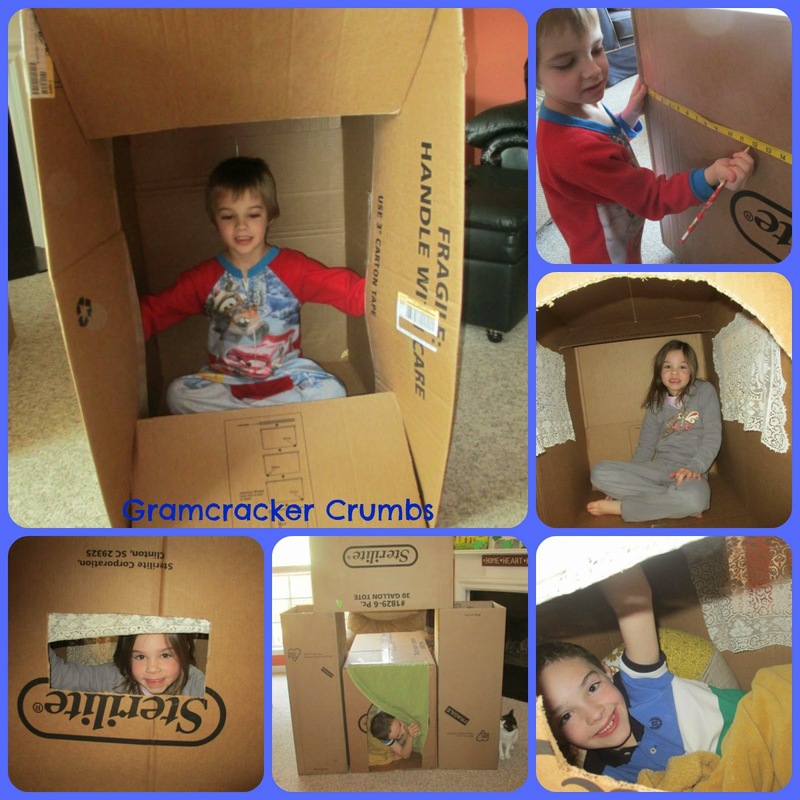 Give me a sand box, empty boxes and blankets for forts any day of the week. Amen, Tammy! Just like the Huff article today says.....let them just be.... and entertain themselves! Thanks for reminding me about blanket forts; going to suggest next time my kiddos are over! Just add some Tupperware and you're good to go..for many, many hours of fun! Love. Sometimes we forget that the simplest things make the best toys. Absolutely! I've gathered some more suggestions in comments here. Anything that requires actually playing and being engaged mentally and physically! Thanks for reading me! With both my children and now my granddaughter I have sometimes thought just getting them a box would be the best gift. My granddaughter enjoyed having a large box last year and thought it was the door to the princess castle. Thanks for sharing.